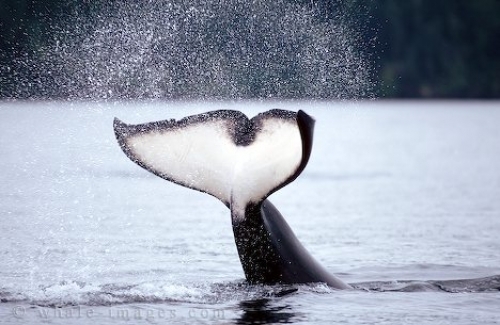 This frisky whale throws spray into the air as it raises its tail flukes. As seen here, the killer whale tail is white underneath with black trim. The edges of each lobe of the whale tail are slightly curved in because there is no bone to support it, only tough dense connective tissue. Orca Whales may raise their tail flukes and then tail slap as a visual and audio display during socializing, after resting, or if disturbed.